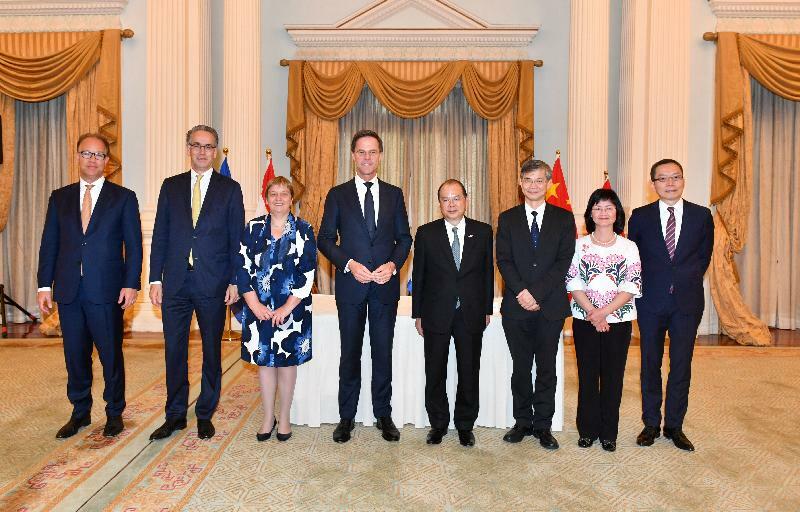 The Acting Chief Executive, Mr Matthew Cheung Kin-chung (back row, right), today (April 9) witnessed with the visiting Prime Minister of the Kingdom of the Netherlands, Mr Mark Rutte (back row, left), the signing of the Memorandum of Understanding between Hong Kong and the Netherlands concerning the Working Holiday Arrangement at Government House. Photo shows the Secretary for Labour and Welfare, Dr Law Chi-kwong (front row, right), shaking hands with the Consul General of the Kingdom of the Netherlands in Hong Kong, Ms Annemieke Ruigrok (front row, left), after the signing ceremony. 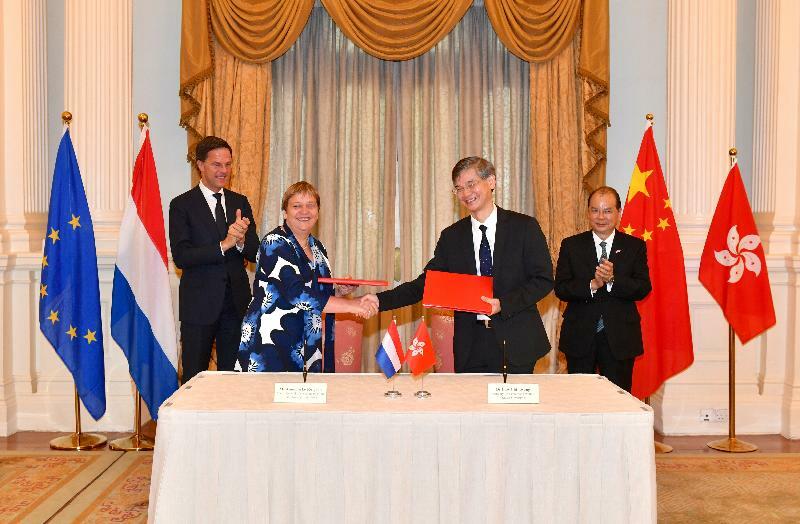 The Acting Chief Executive, Mr Matthew Cheung Kin-chung, today (April 9) witnessed with the visiting Prime Minister of the Kingdom of the Netherlands, Mr Mark Rutte, the signing of the Memorandum of Understanding between Hong Kong and the Netherlands concerning the Working Holiday Arrangement at Government House. Mr Cheung (fourth right) and Mr Rutte (fourth left) are pictured with the Secretary for Labour and Welfare, Dr Law Chi-kwong (third right); the Permanent Secretary for Labour and Welfare, Ms Chang King-yiu (second right); the Commissioner for Labour, Mr Carlson Chan (first right); the Consul General of the Kingdom of the Netherlands in Hong Kong, Ms Annemieke Ruigrok (third left); the Chief of Staff, the Kingdom of the Netherlands, Mr Paul Huijts (second left); and the Director, Asia and Pacific Affairs, Ministry of Foreign Affairs, the Kingdom of the Netherlands, Mr Peter Potman (first left), after the signing ceremony. Hong Kong and the Netherlands today (April 9) signed a Memorandum of Understanding (MoU) to mark the establishment of a bilateral Working Holiday Scheme for young people of the two places. The agreement was signed by the Secretary for Labour and Welfare, Dr Law Chi-kwong, and the Consul General of the Kingdom of the Netherlands in Hong Kong, Ms Annemieke Ruigrok, at Government House in the presence of the Acting Chief Executive, Mr Matthew Cheung Kin-chung, and the Prime Minister of the Kingdom of the Netherlands, Mr Mark Rutte. Welcoming the establishment of the scheme with the Netherlands, Dr Law said, "Apart from broadening their horizons, this scheme provides an opportunity for young people in Hong Kong and the Netherlands to gain living and working experience in a foreign culture. It will also further reinforce bilateral ties between Hong Kong and the Netherlands." Ms Ruigrok hailed the MoU as a sign of the excellent shape of bilateral relations between the Netherlands and Hong Kong. She encouraged young people to make full use of the opportunities provided by the scheme. "This will lead to a deeper understanding of each other's cultures, which will further strengthen our relations, today and in the future," she said. The scheme with the Netherlands is Hong Kong's 13th bilateral working holiday scheme. Since 2001, Hong Kong has established working holiday schemes with New Zealand, Australia, Ireland, Germany, Japan, Canada, Korea, France, the United Kingdom, Austria, Hungary and Sweden. So far, more than 85 000 Hong Kong youths have benefited from these schemes. The Working Holiday Scheme between Hong Kong and the Netherlands will commence operation on January 1, 2019. Under the scheme, youths from each side will be able to apply for a visa, which will allow them to stay in the Netherlands or Hong Kong for up to 12 months. During the period, they may work to finance their stay or study short-term courses. There will be an annual quota of 100 from each side. Details of visa application procedures for applicants from Hong Kong will be available on the website of the Consulate General of the Kingdom of the Netherlands in Hong Kong at www.netherlandsandyou.nl/your-country-and-the-netherlands/hongkong in due course. Applicants from the Netherlands may contact the Hong Kong Immigration Department by telephone on 2824 6111 or obtain the necessary information from the department's website www.immd.gov.hk.